Fast Track: Genesis to Revelation - Leader Kit provides leader helps for this discipleship experience that introduces the entire Bible quickly. The Leader Kit includes everything you need to facilitate a Bible study: a small-group member Workbook, the Fast Track Story of the Bible, and two DVDs featuring eight 30- to 35-minute teaching videos. It has two components: a group track and a personal track. The group track uses elements typical of any group study to "drill down" into the identified theme of each of the eight sessions. The personal track is biblically rich. Consisting of five "between-meeting" activities, these experiences explore some of the major events, circumstances, or biblical figures identified in the Fast Track study. Each session includes a "Point to Jesus" component that highlights a gospel-centered paradigm of each Fast Track chapter. 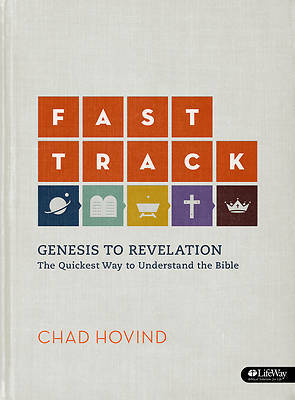 Fast Track Story of the Bible summarizes Genesis to Revelation in eight short chapters and can be read in one sitting. Using easy-to-follow visuals throughout, the reader is able to track along with the main characters, themes, and movements. Chad Hovind is an educator, dynamic business communicator, marriage instructor, and creative teacher. He is author of Godonomics: The Biblical Case for Free Market Capitalism. Chad's been a featured speaker at Glenn Beck's Restoring Love, Patriot Events, the 9-12 Project, and pastor's training events with Congressman Bob McEwen and David Barton. He has served as pastor at three high-impact mega churches within the Willowcreek Association.